Formulated to Mitigate Canine Allergy Anxiety. Is Your Dog “Trapped” in an Itchy Allergy Body ? An End Less / LifeTime of Allergy Itch > Drives> Anxious Behavior. 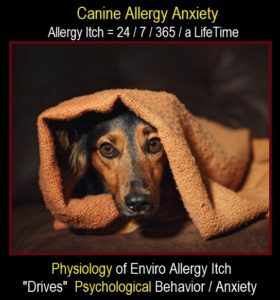 Canine Allergy Anxiety = A LifeTime of 24 / 7 / 365 > “Allergy Itch” that cannot be Itched = Heightened Anxiety / Erratic Behavior / Mood Shifts. 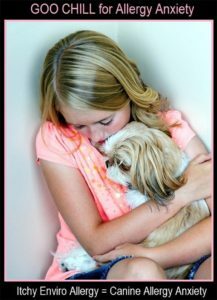 Canine Allergy Anxiety – Leading to increasing Erosion of Human-Canine Bond Issues is a Major Factor leading to Surrender of Dogs to Shelters. Anxiety DisOrders can be Triggered by a Hyper-Sensitized “Allergy” Immune System and thus, affect Cognitive Functioning. When in Danger, Fear is Essential for Survival. This Fear triggers the Brain to Respond with many Split-Second Changes in the body to Prepare to Defend against the Danger. This Response is a Healthy Reaction meant to Protect an Animal against Harm. But in a Canine suffering from 24 / 7 / 365 / a Lifetime of Canine Allergy Anxiety, this Reaction is Enhanced such that the “Fear Memory” is Ever-Present. GOO CHILL is a 100% Natural Calming Supplement and does not include any Drowsy Ingredients. The ideal Calmer for any Dog showing Signs of Stressful Behavior including Fear, Nervousness, Vocalization, Agitation, Tension or Aggression. GOO CHILL is Safe and the Administration Level can be Infinitely Adjusted, enabling Pet Parents to find a Level that suits each individual Animal’s Stress Tolerance Level. 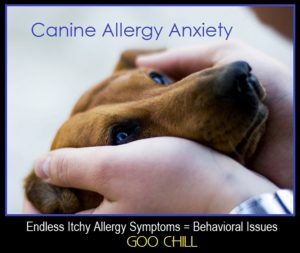 Because Canine Allergy Anxiety is “Driven” by the Progression of an “Internal” Allergy Fire / Disease, GOO CHILL is suggested in Conjunction with Allergy Fighting Doggy GOO. 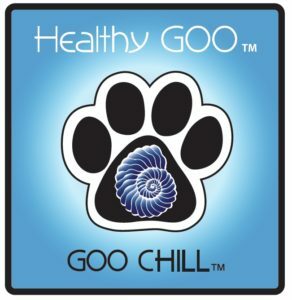 The Goal of GOO CHILL is to provides “Calming” Benefits while Doggy GOO is increasingly building “Internal” Immune Tolerance to Major Enviro Allergy Sources, with the Doggy GOO Goal, that over a Modest Duration, “External” Allergy Symptoms are increasingly Mitigated, (dare we say ) are eventually No Longer Triggered. 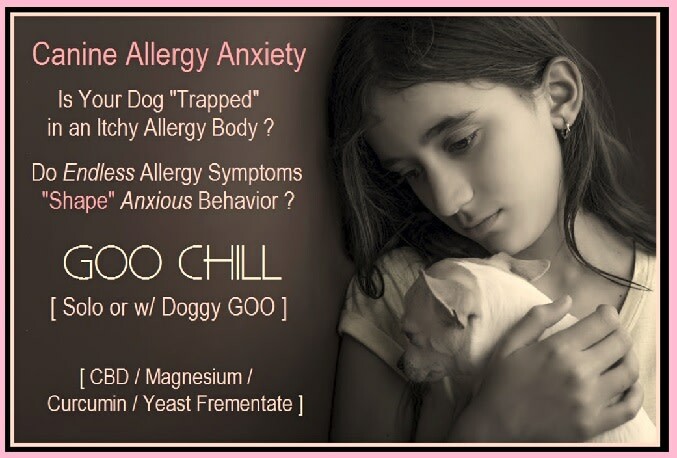 Then as heightened Enviro Allergy Immune Tolerance is achieved and Itchy Symptoms are Increasingly Mitigated / No Longer Driving Animal Anxiety and returns to Normalcy, GOO CHILL can be Tapered as Pet Parent deemed appropriate. GOO CHILL’s “Calming” Characteristics are also suggested for heightened Stressful Periods such as Trips, Boarding Periods, Compromised Health Issues, New Environments, Separation. Full-Entourage PhytoCannabinoid (CBD) Oil promoting Physical & Cognitive Calming ( 1 mg / Tsp ). Bio-Enhanced Magnesium L-Threonate promotes Neurological & Cognitive Calming. Optimized Curcumin improves Cognitive Function & Mood. Reduces Overall & Neuro-Inflammation. Yeast Fermentate Dampens GUT-Biome Stress. 100% GOO-Licious Peanut Butter Treat. ALLERGY is More than an Itchy Dog ! Anxious / Edgy / Irritable / Moody ? Time for GOO CHILL ! Are Your Dog’s Itchy Enviro Allergy Symptoms “Shaping” your Dog’s “Anxious” Behavior ? 24 / 7 / 365 / a Lifetime of Enviro Allergy Symptoms = Canine Allergy Anxiety. 75+% Itchy / Paw Chewing / Gunky Ear / Skin Issue Dogs suffer from Enviro Allergy to Same Enviro Pollens / Dust Mites / Molds as Us Humans Suffer from !
. Full-Entourage PhytoCannabinoid (CBD) Oil promoting Physical & Cognitive Calming ( 1 mg / Tsp ).
.  Bio-Enhanced Magnesium L-Threonate promotes Neurological & Cognitive Calming.
.  Optimized Curcumin improves Cognitive Function & Mood. Reduces Overall & Neuro-Inflammation.
.  Yeast Fermentate Dampens GUT-Biome Stress.
.  100% Natural GOO-Licious Peanut Butter Treat.
.  Use GOO CHILL “Solo” or with Allergy Fighting Doggy GOO.